The new Globethics.net book Cyber Ethics 4.0: Serving Humanity with Values (Global Series no. 17) was launched on 15 November 2018 in New Delhi at the International Conference on Cyberlaw, Cybercrime and Cybersecurity. 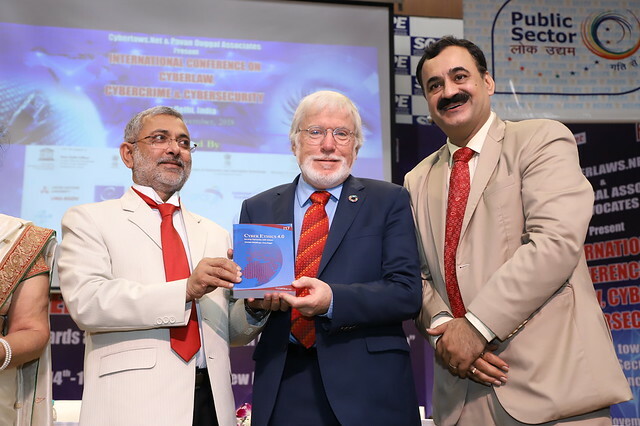 The 500-pages book that features 25 contributions from authors in all continents was handed over to the Supreme Court Judge of India by volume editors Professor Christoph Stückelberger (Globethics.net President) and Dr. Pavan Duggal (Globethics.net Board member). The book covers a wind range of topics on ethics, disruptive technologies, artificial intelligence, Blockchain, autonomous weapons (and its positive and negative impact on jobs), on health, social media use and on net neutrality. The book suggests solutions on ethics and legal regulations of the new technologies, as well as ethics and media and educational efforts for children and youth protection. It can be downloaded for free at Globethics.net/publications. Paperback versions of the book are available for purchase at Amazon.